If the time has come to replace that aging or malfunctioning heating unit in your Carlisle PA, Chambersburg PA, or Harrisburg PA-area home, a gas furnace deserves strong consideration. Natural gas burns cleanly and efficiently — in several ways, it’s the cleanest-burning fossil fuel there is, enabling you to reduce your environmental footprint. And if you’re looking for ways to lower your home heating bills, natural gas can provide a more cost-effective alternative to oil heat. What’s more, a gas furnace is an excellent choice if you don’t want to install or rely exclusively on a heat pump. If you live in Carlisle PA, Chambersburg PA, Harrisburg PA, or elsewhere in the South Central PA region and have access to a natural gas line, Tuckey Mechanical Services can provide you with a top-quality natural gas furnace at a competitive price. Though we service all major brands of gas furnaces, we’re proud to recommend quality Bryant gas furnaces for new installations and replacements. Since 1904, Bryant home comfort products have set the standard for the entire industry. You’ll find a wide assortment of Bryant gas furnace models that will make combating those bone-chilling South Central PA winters so much easier — and more affordable. Increased gas efficiency: Many Bryant models include a secondary heat exchanger that extends the transfer of heat, providing more efficient use of natural gas. Energy savings: Are you fed up with high heating bills? A Bryant gas furnace is designed to maximize gas efficiency, which helps to prevent the waste of energy. You’ll notice the difference in the form of lower heating costs. Responsiveness: The advanced furnace control system responds to changing temperature conditions to ensure maximum comfort throughout the day and night. Reliability: The revolutionary Bryant igniter setup ensures your system will start promptly whenever you need it. 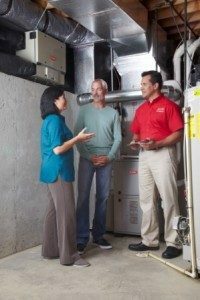 Expert product selection guidance: The team at Tuckey Mechanical Services will help you explore all your gas furnace options, allowing you to choose the model that’s perfect for your home heating needs and budget requirements. Though we’re proud to recommend quality Bryant equipment, we’re happy to help you explore your options across various system configurations and manufacturers. Fast installation: Most experts agree that equipment brand and selection are important – but proper design and installation are critical. That’s why choosing the right HVAC contractor is such an important decision! Once you’ve chosen your gas furnace, we’ll handle every aspect of the installation from start to finish. Whether you own a Bryant gas furnace or a different model, you can trust Tuckey Mechanical Services to keep it running. 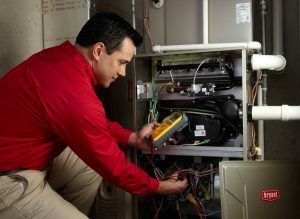 We service all major brands of gas furnaces, backed by industry-recognized certifications and experience to handle whatever comes our way. If your unit breaks down in the dead of winter, we’re available to deliver 24/7 emergency service. Learn more about the many ways in which a gas furnace from Tuckey Mechanical Services can keep your Carlisle PA, Chambersburg PA, or Harrisburg PA-area home warm and comfortable all winter long. Contact us for more information and a free estimate. "Dave W did a very professional job checking out both my furnace and air conditioner. He explained what he was doing in language I could understand and did not waste time. Very personable and polite. Great job!"